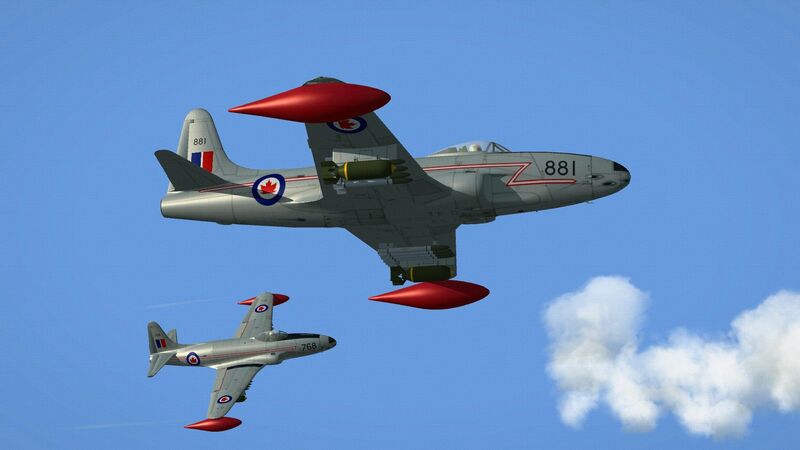 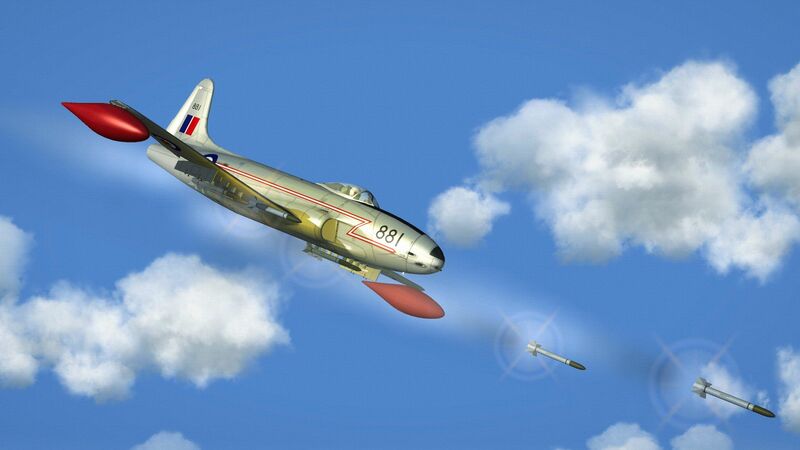 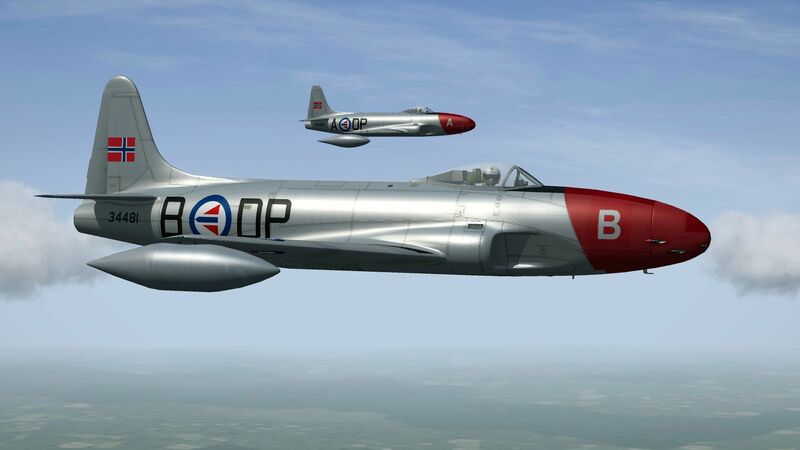 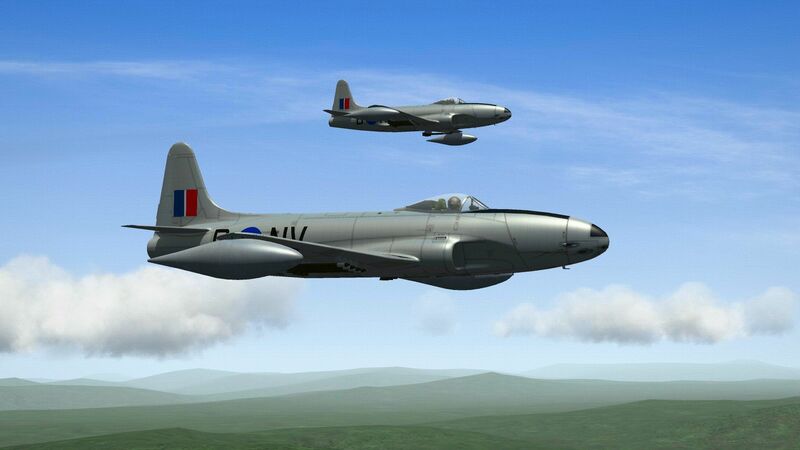 Despite the generally successful introduction into service of the Gloster Meteor and de Havilland Vampire jet fighters the RAF ordered 70 Lockheed P-80A Shooting Stars for use with RAF South East Asia Command with deliveries commencing in June 1946 and these were soon in action with No.60 Squadron and No.79 Squadron during the Second Battle of Surabaya in March 1947. 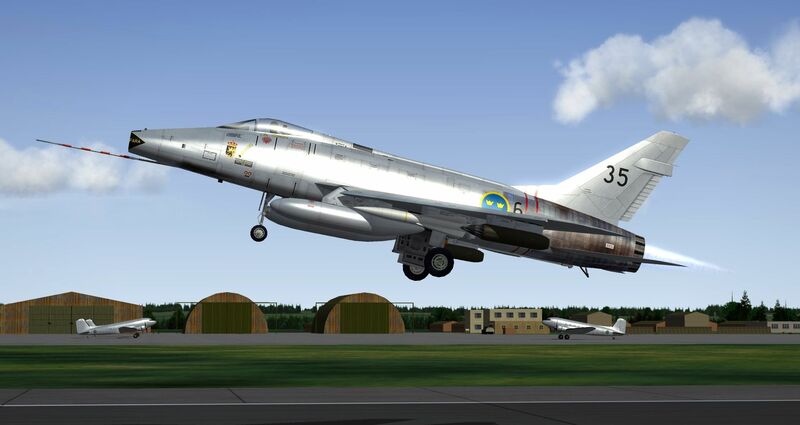 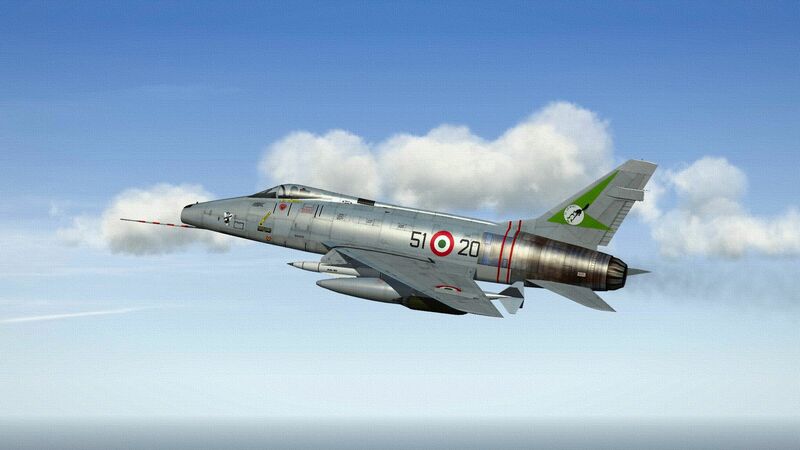 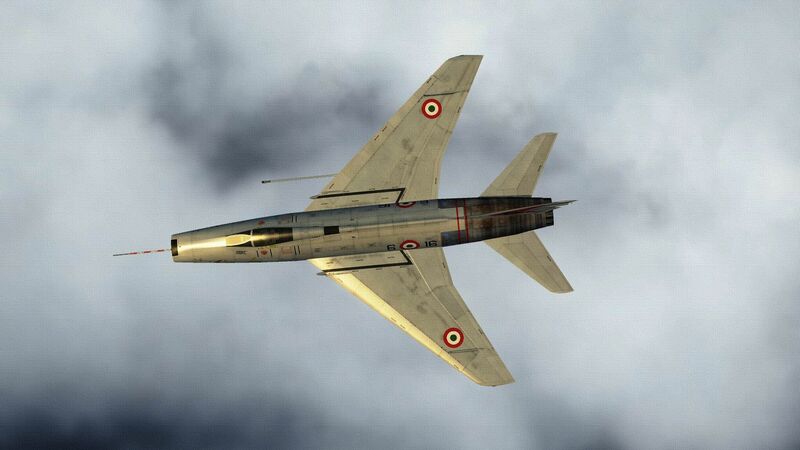 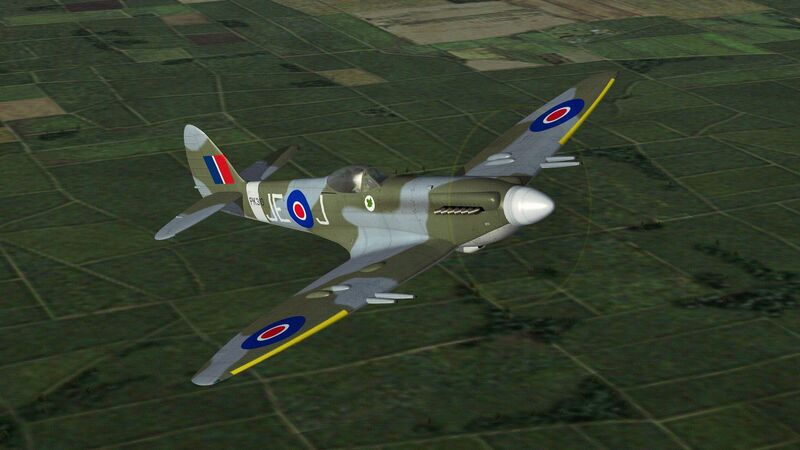 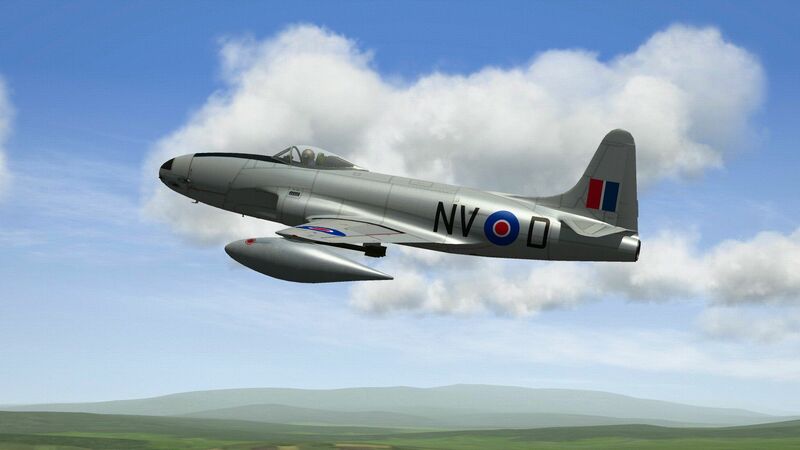 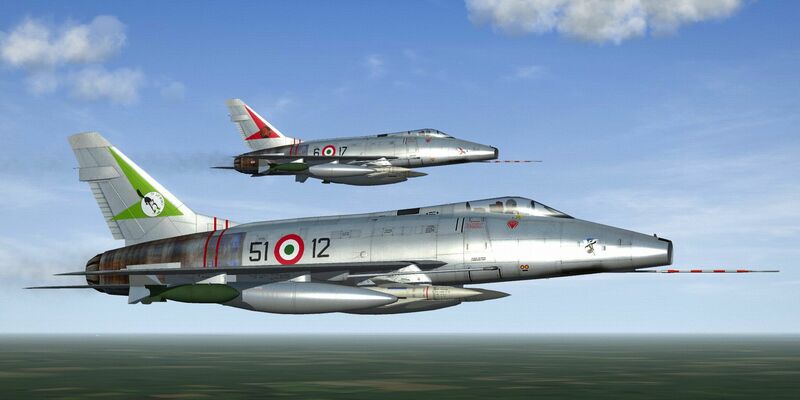 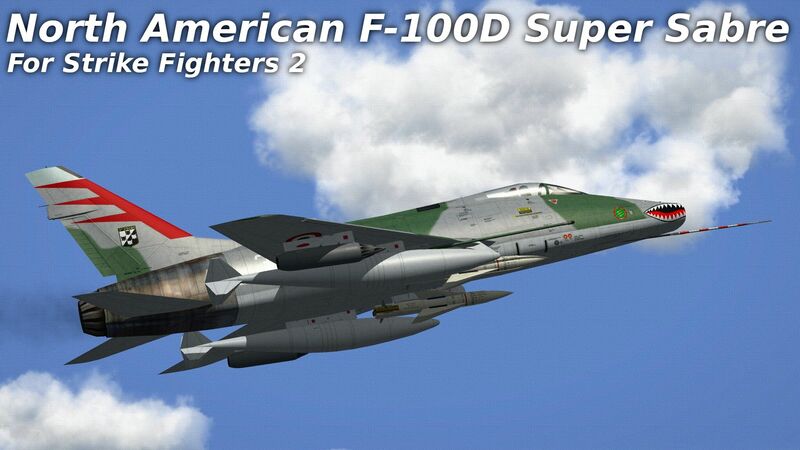 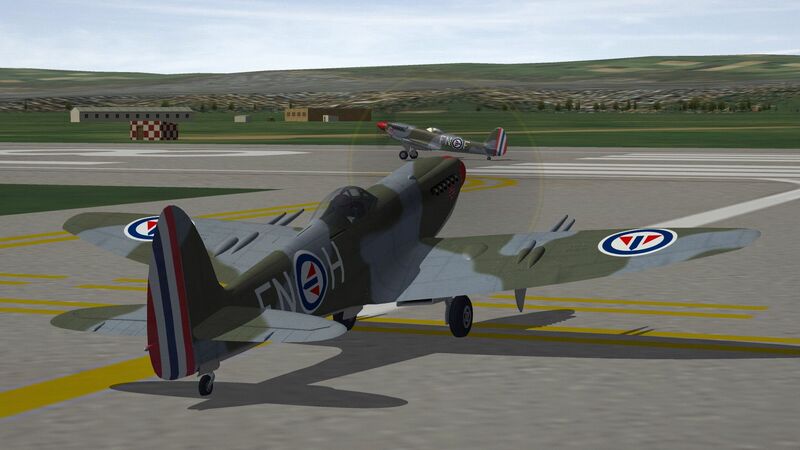 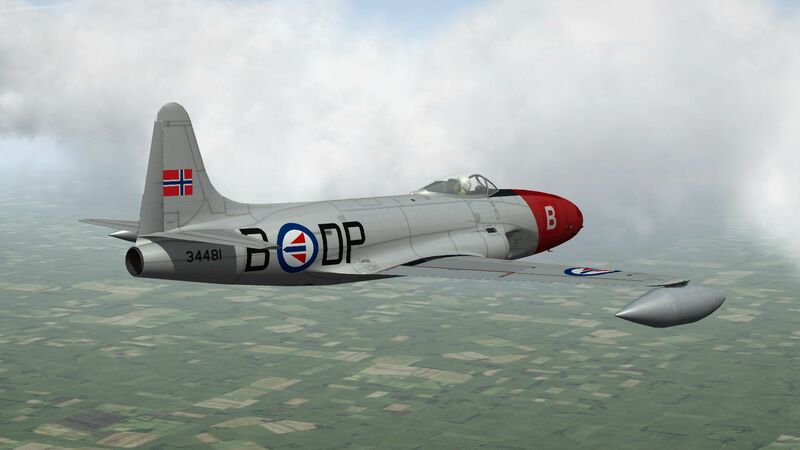 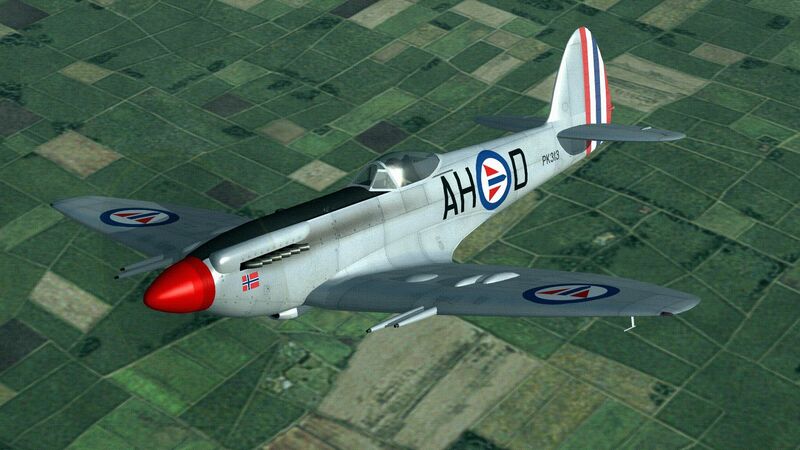 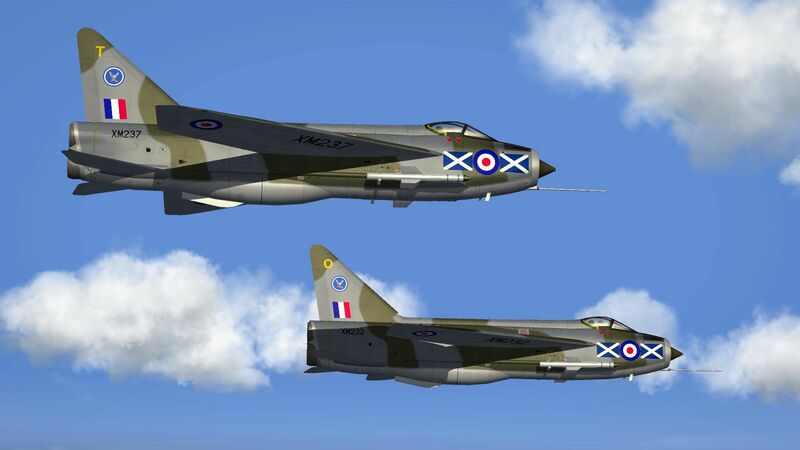 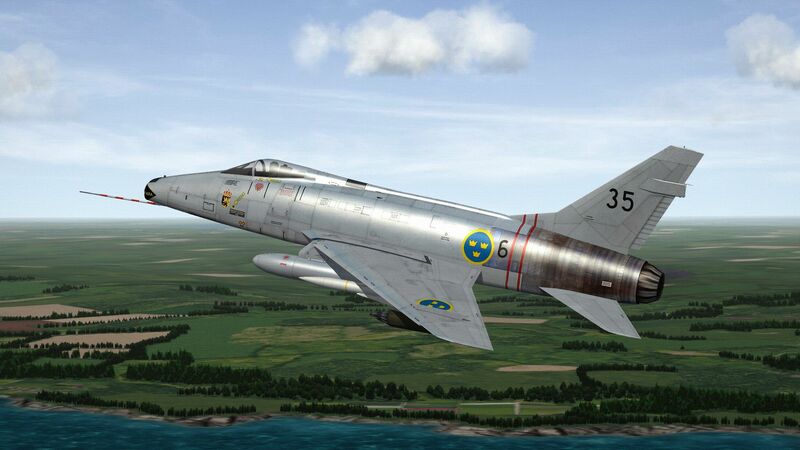 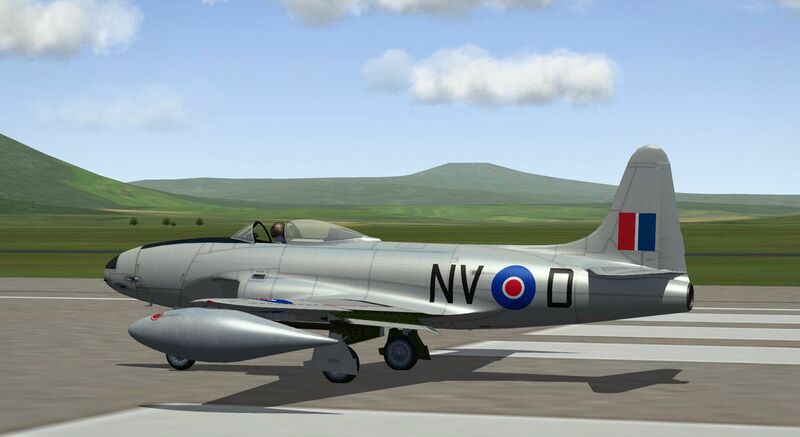 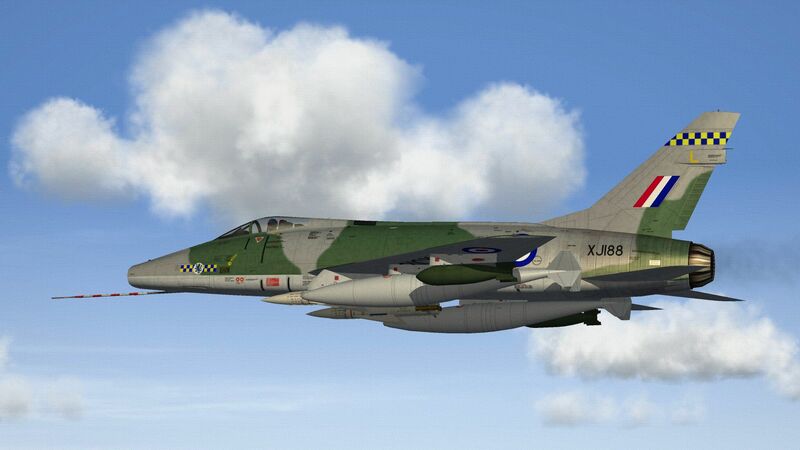 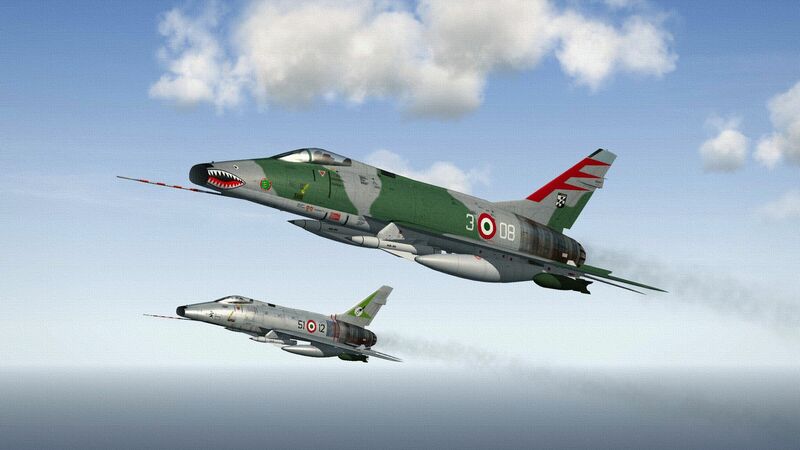 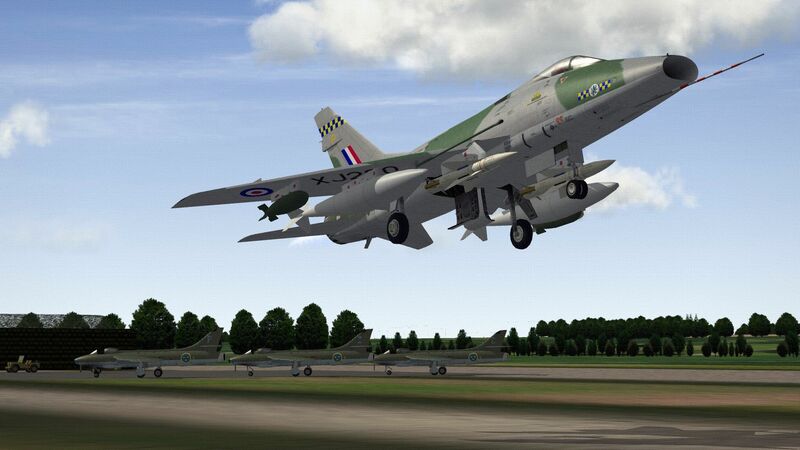 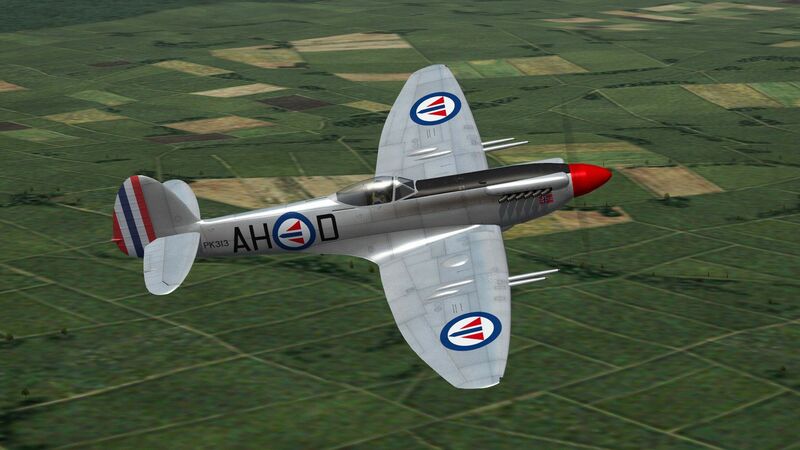 I was given a lovely blank silver skin for the recently released F-80C by the DAT group of modders. 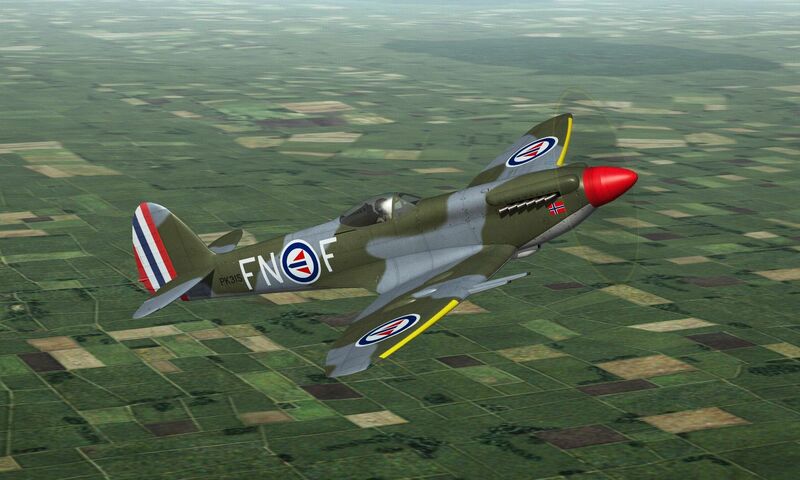 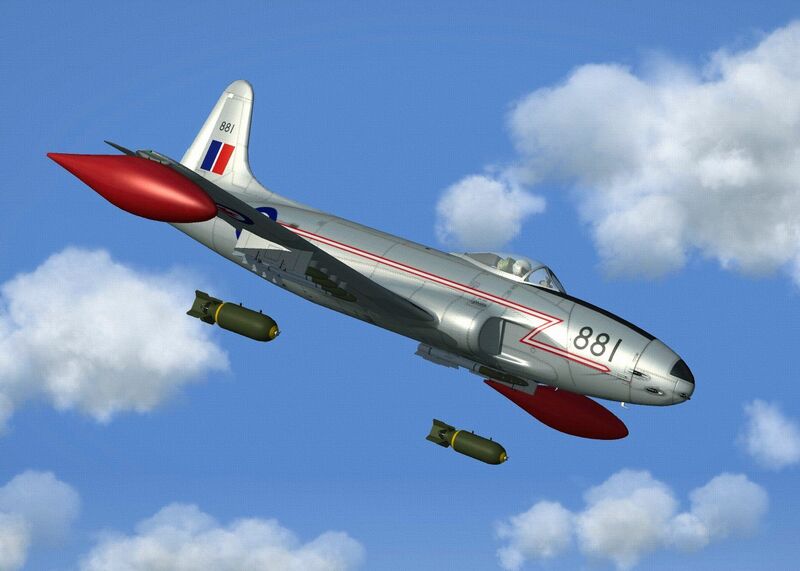 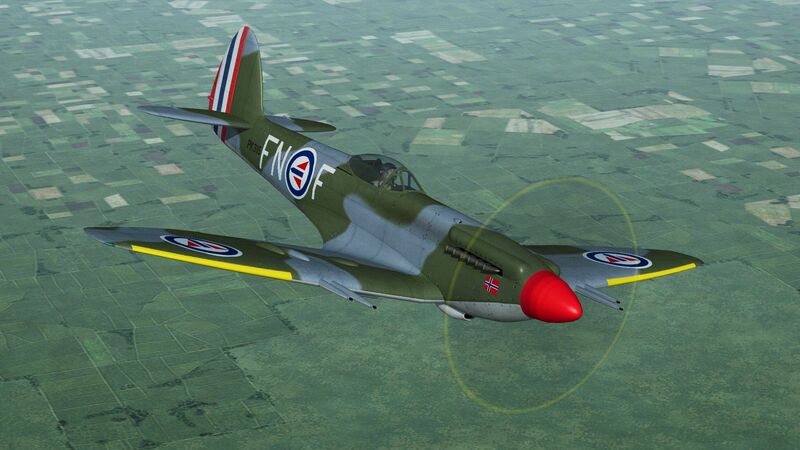 It's a lovely 3D model with a top notch skin by 'Charles' and I think the F-80 is ripe for 'what ifs' as, for example, none were operated by European air forces. 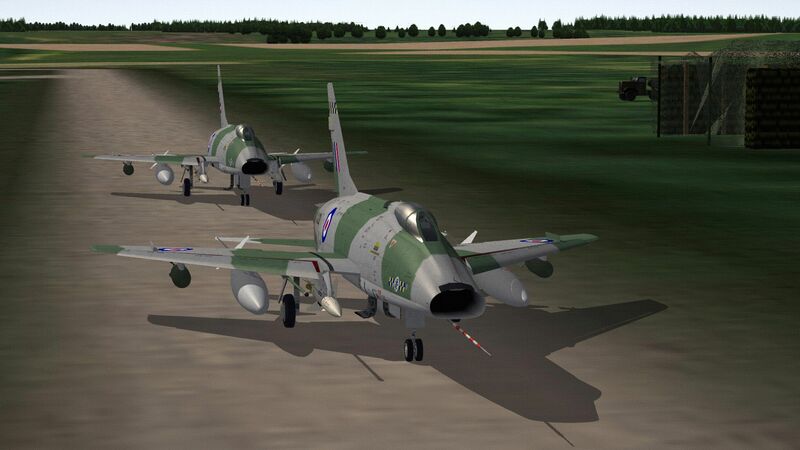 The earlier establishment of the German Air Force is one possibility. 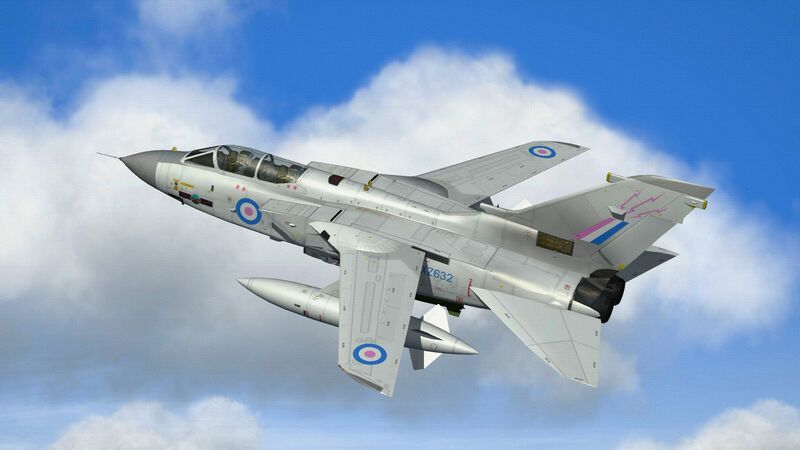 The Tornado entering service and the V-Bomber style 'anti-flash white' paint scheme missed each other by nearly 20 years but, to my rose-tinted eyes, look like a match made in heaven! 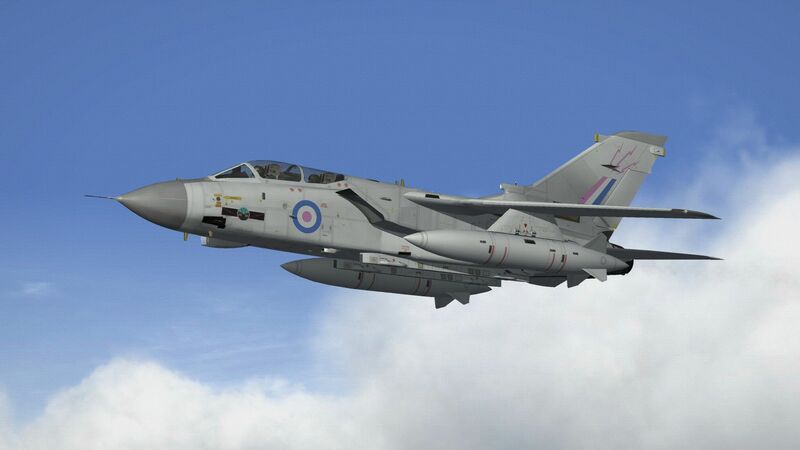 I've toned down the radome and fin-cap to a light-ish grey in keeping with the anti-flash ethos but the ground crew would have loved keeping the Tornado's sooty fin clean - I think not! 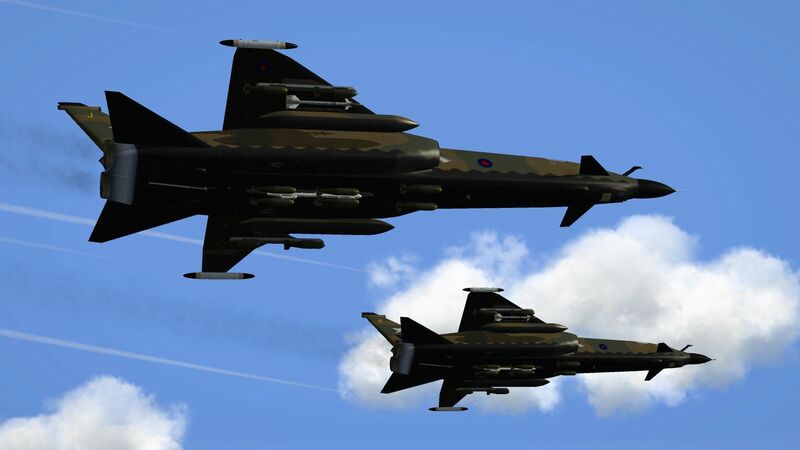 I was going to do an earlier entry to service so have left the outer pylons and defensive countermeasures off but might add them back at some time. 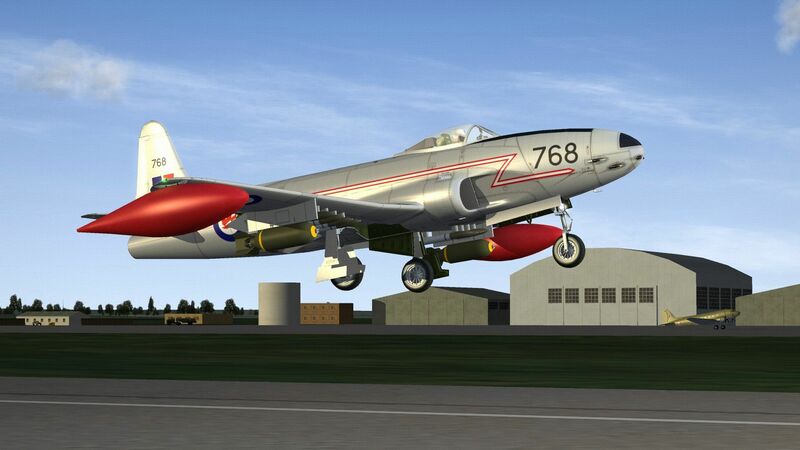 I'm really digging the new F-80C from the DAT group of modders and thought it would look good in RNAF markings to which I've added a fin flash as I can't stand bare fins on any aircraft. 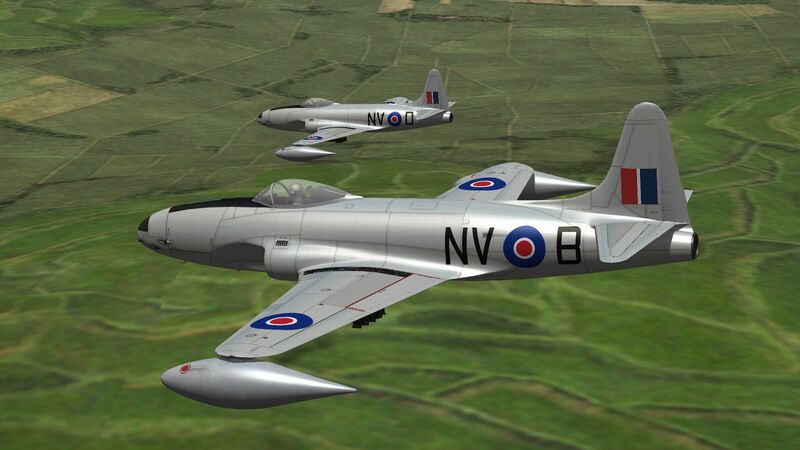 There really was a Jet Training Flight but they operated the de Havilland Vampire. 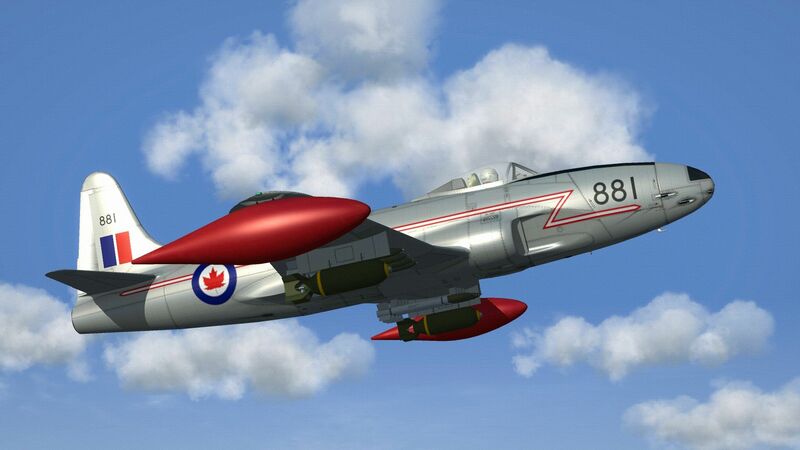 The red nose is actually a bit of a mistake as I used a stock letter decal that has no border which turns the entire mesh red. 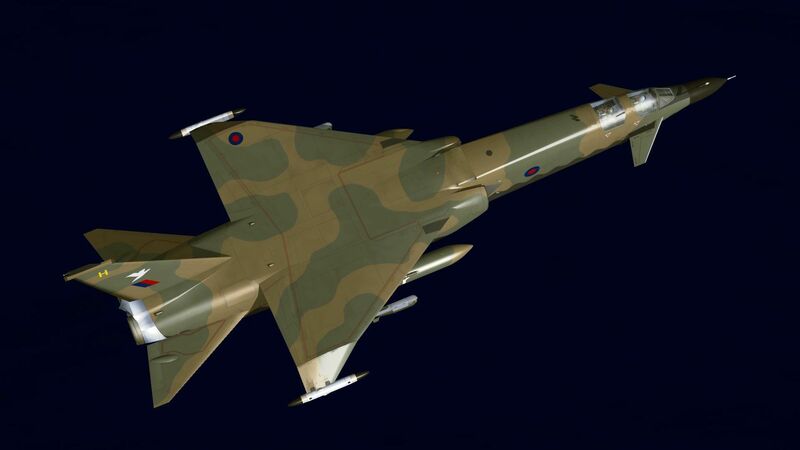 It looks quite good but unfortunately it does also overpaint most of the anti-dazzle panel. 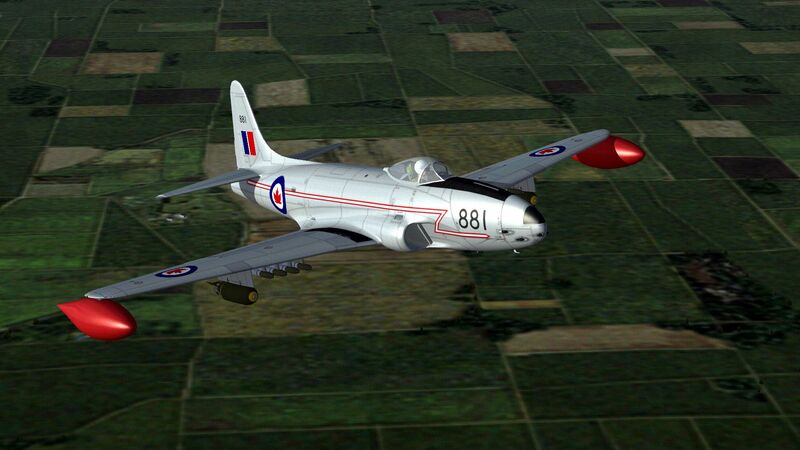 Markings wise this is a bit of a hybrid as the F-80C is a bit too early for the classic 'Canada Flash' cheatline as seen on the RCAF's Voodoo's but it looks pretty cool to me!. 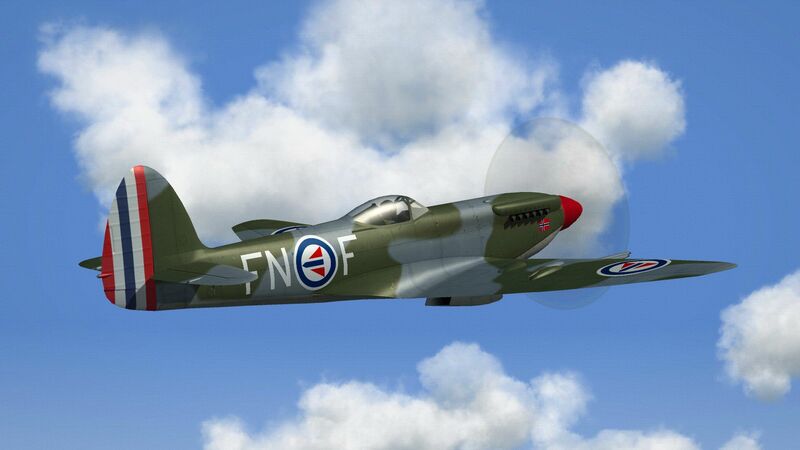 The cheatline took me a fair while to work out as it needs to be combined with the roundel to make one big decal to which can then be applied 85% opacity. 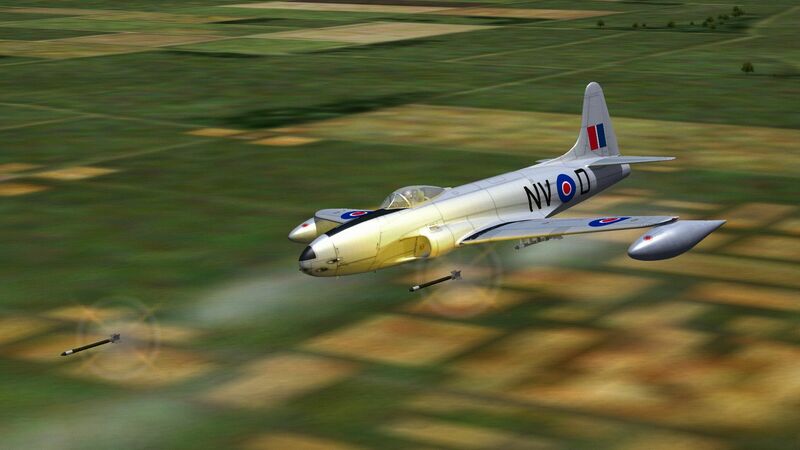 Doing them separately leads to the cheatline being seen through the roundel or the roundel needing 100% opacity which always looks a bit harsh. 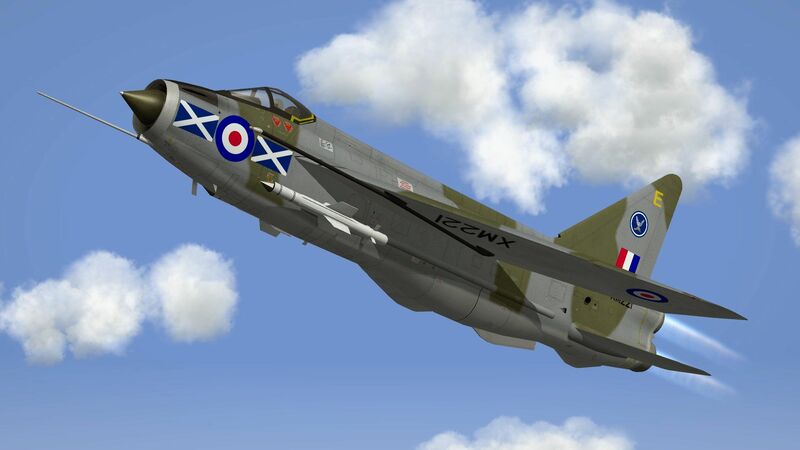 Sometimes, markings can simply be applied to the skin bitmap but the nose, fuselage and tail were all separate and would require more trial and error than I can cope with as I'm not as patient as I'm always keen to move on. 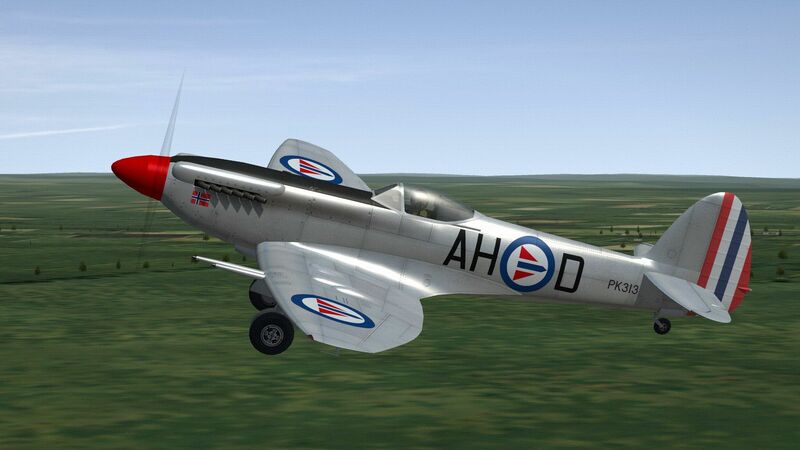 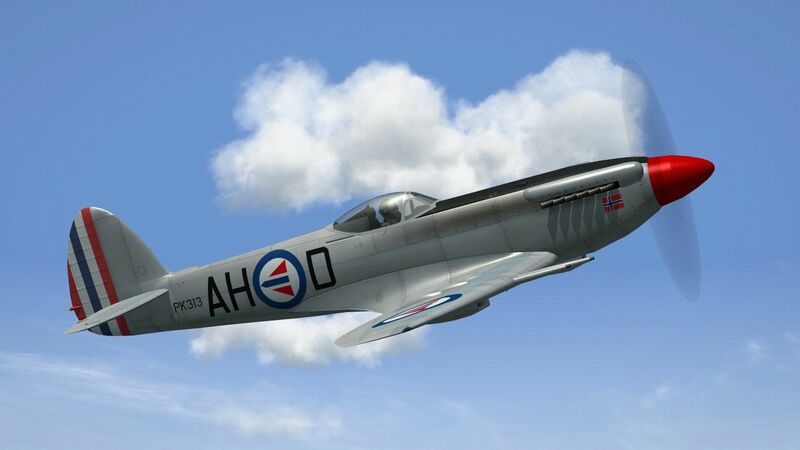 There are quite a few photo's showing Norwegian Spit's with big white outlines on the roundels and rudder stripes so I thought I'd combine them on a real late model Spitfire. 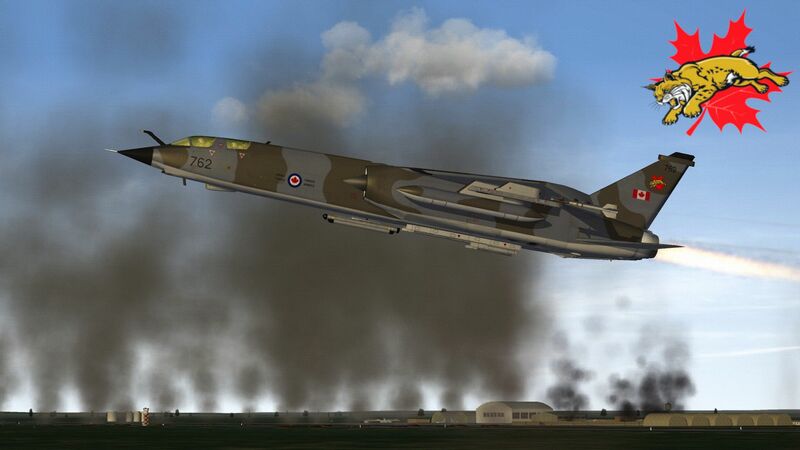 Impressively smoky engines! 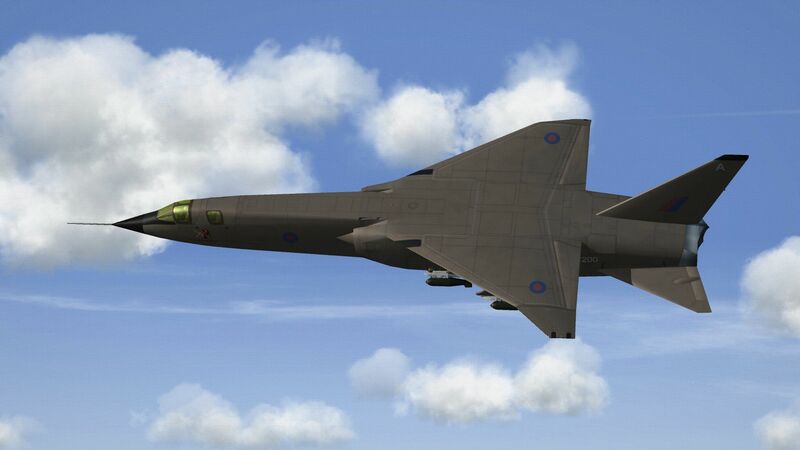 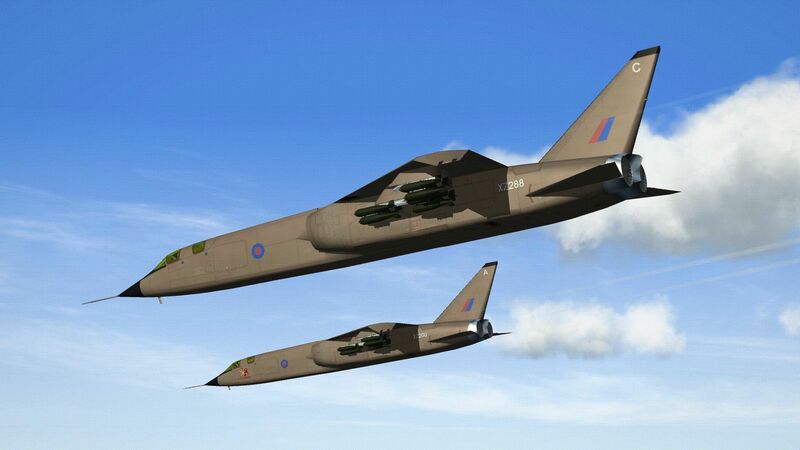 Note the revised undercarriage layout that Sundowner has worked into his developed TSR.2 which loses the internal weapons bay to accommodate the wider undercarriage assemblies and turbofan engines with under-fuselage weapon pylons more than making up for 'lost' weapon capacity from the bomb bay. 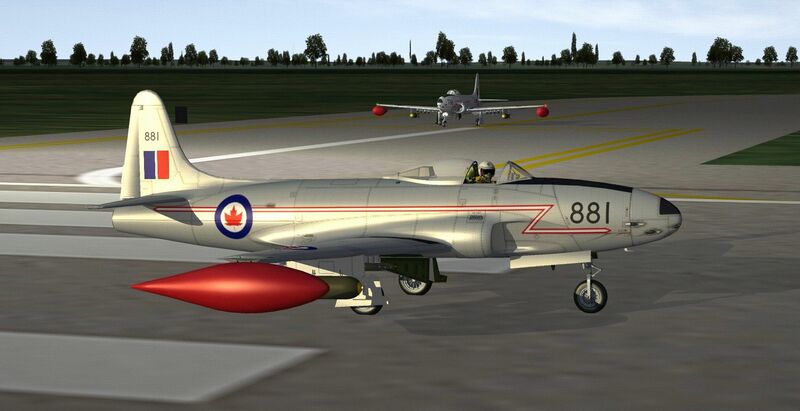 This is one of at least three RCAF skins that Sundowner had done for the TSR.2 and I've just added some generic serial numbers (actually CF-104 numbers) plus the 416 fin marking. 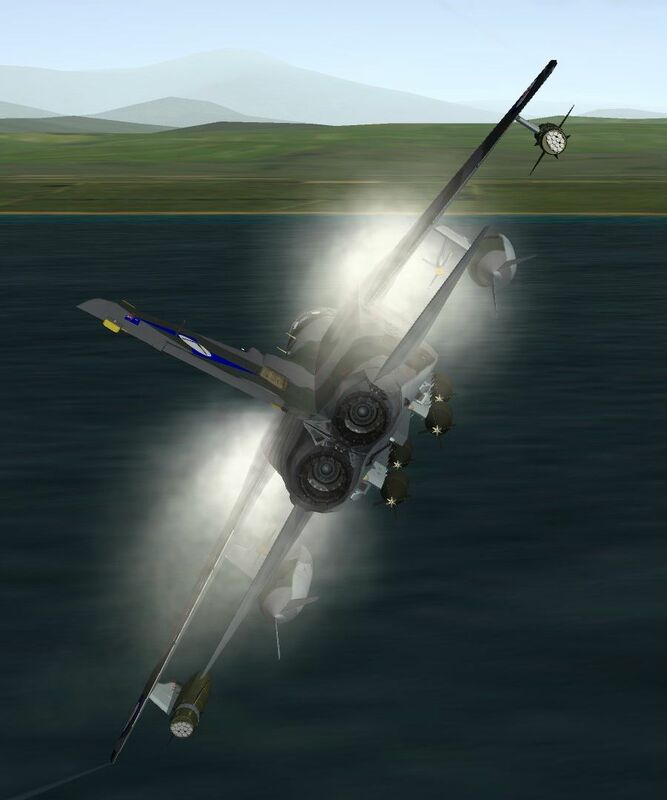 Late model Spit's (Marks 14, 18, 22 and 24) are well covered by Third Wire (the game developer) but all have the cut down rear fuselage. 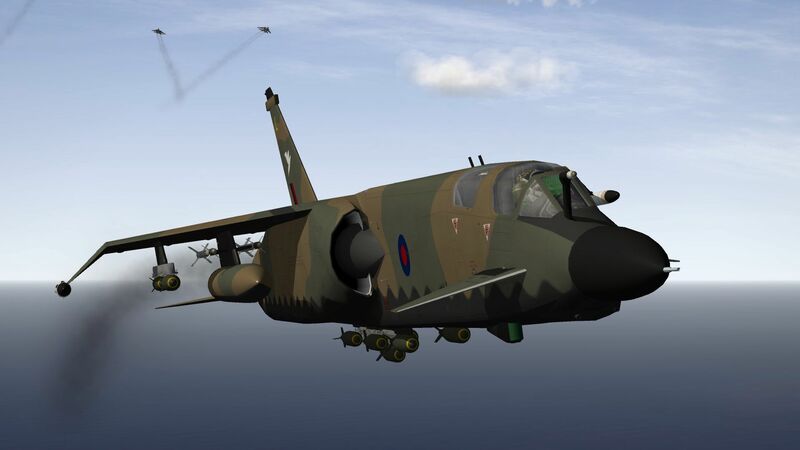 The Mark 22 has standard RAF camo and NMF (silver paint I guess) and for this No.322 squadron machine I've added my rudder strips, recoloured the spinner and given it some more traditional RNoAF markings. 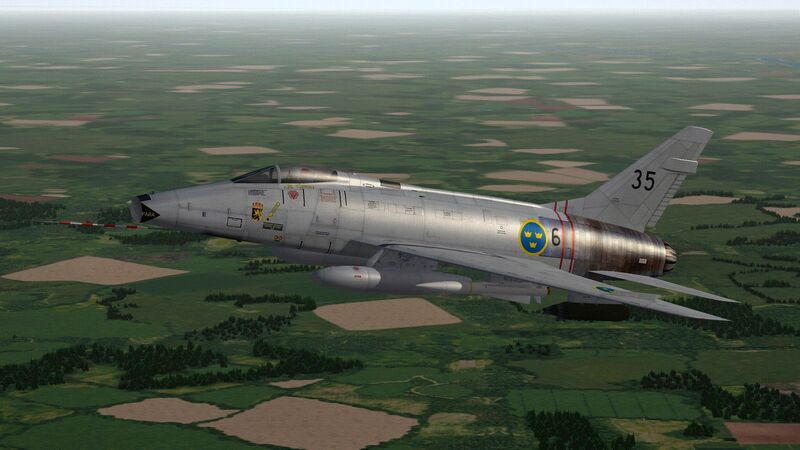 Let's just call it a scratch I had to itch! 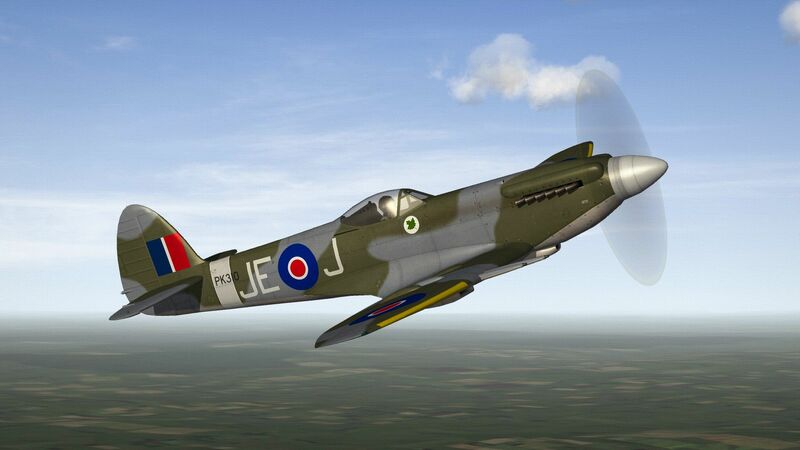 I probably should have stuck with the Type C1 roundel (yellow outline) on the fuselage but I've always liked that picture of Douglas Bader's post-war Spitfire with the Type C roundel on the fuselage. 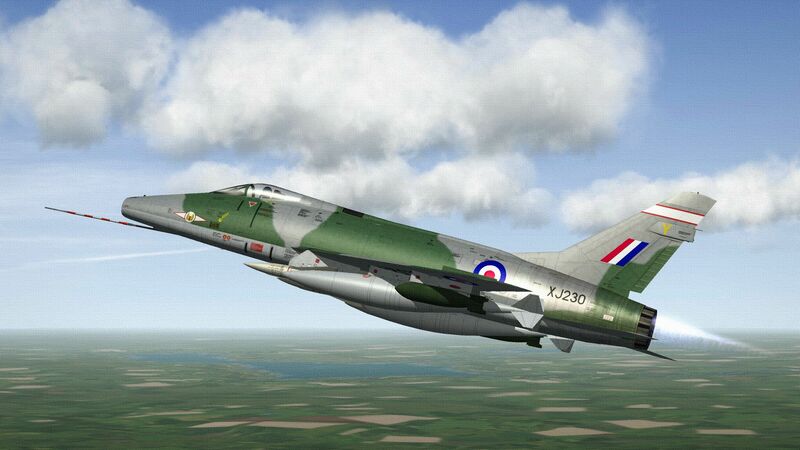 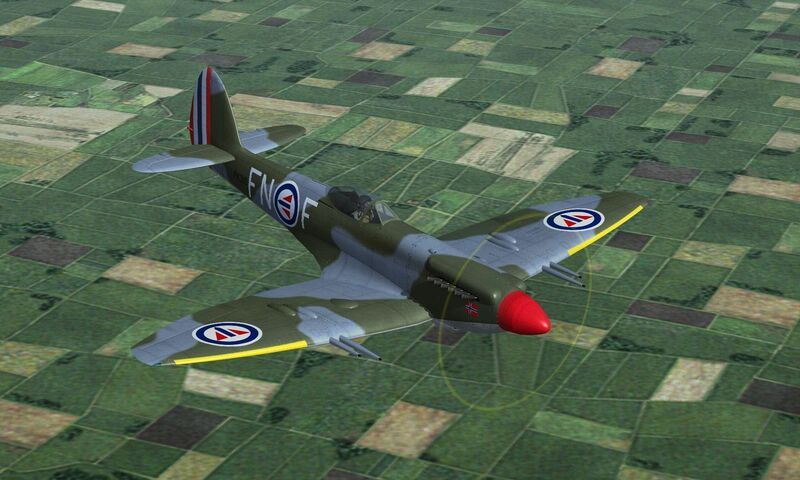 There seems to be much debate on whether the maple leaf should be red or green but I reckon Airfix got it right! 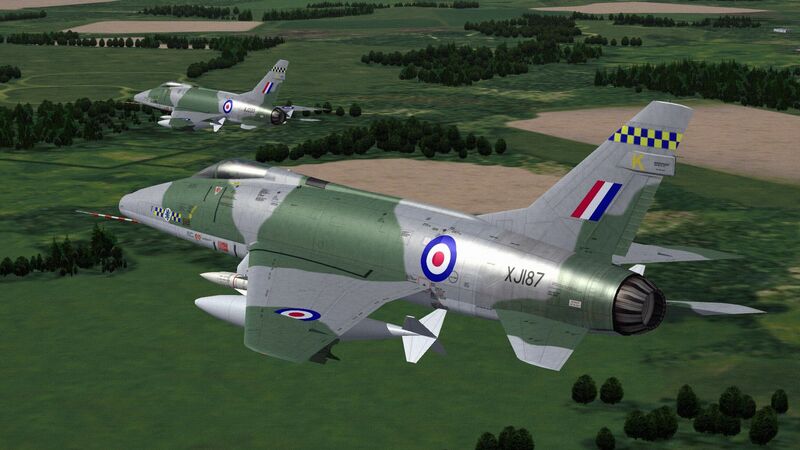 I must of had at least six of those JE-J kits when I was a teenager. 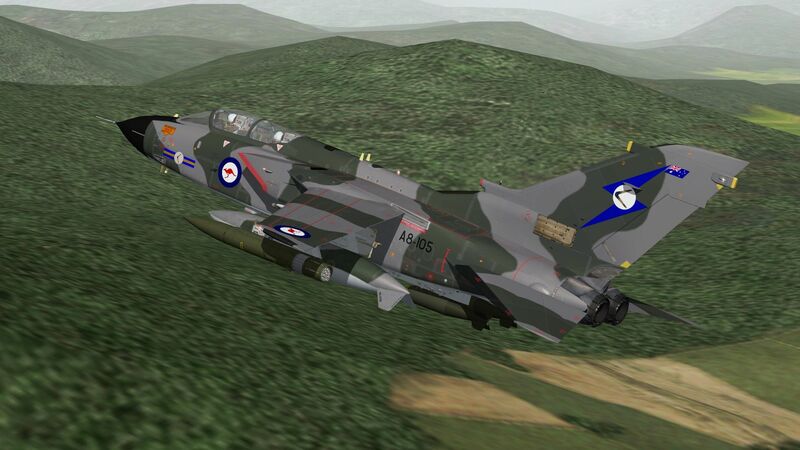 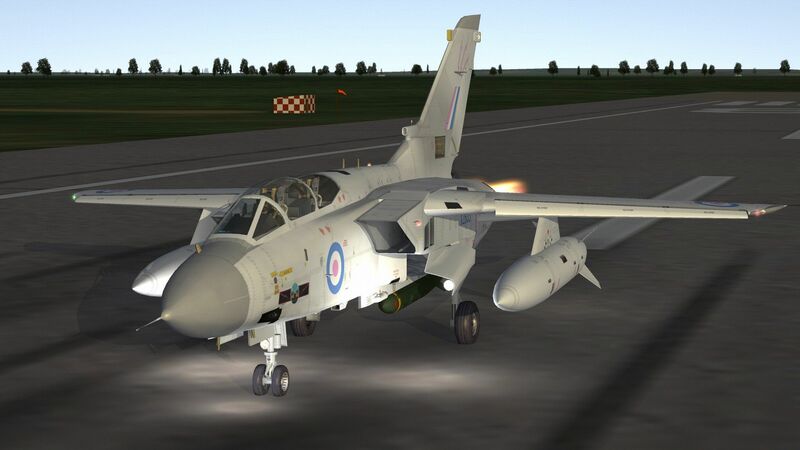 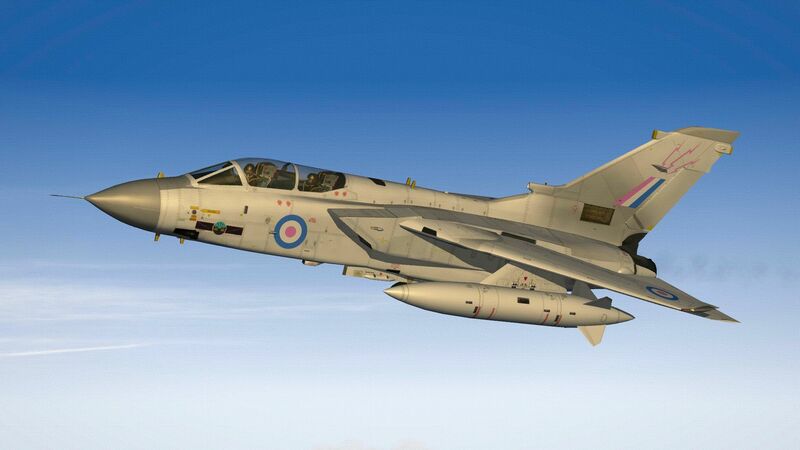 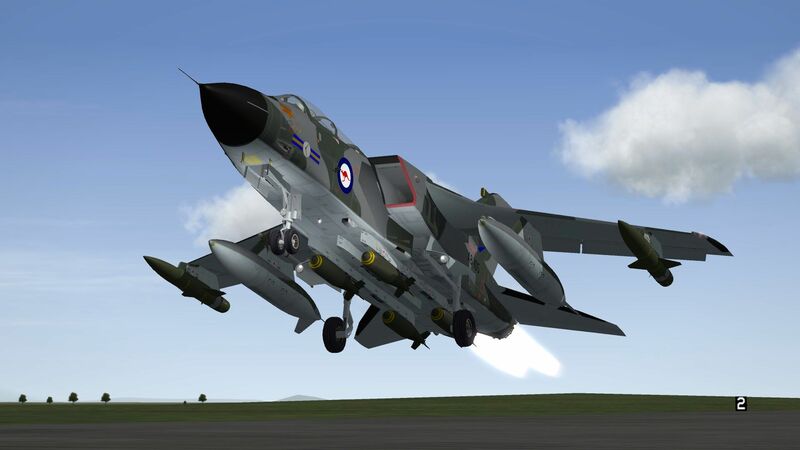 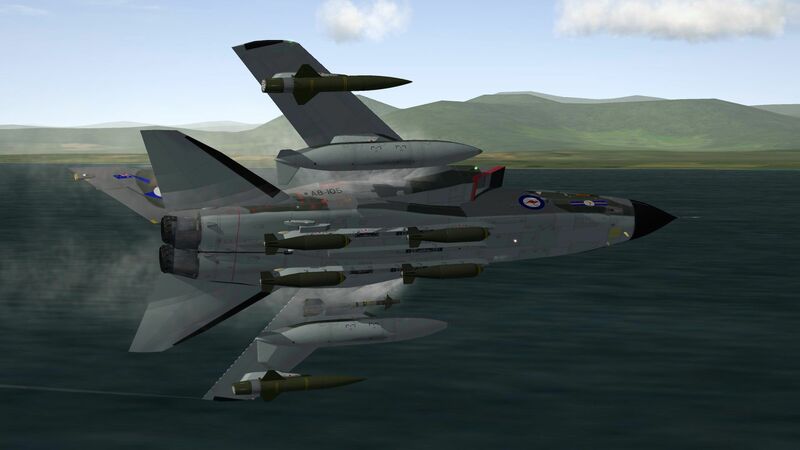 This is essentially an early Italian skin made from the awesome template provided by the 3D modeller and I've added some RAAF markings including my No.6 squadron tail marking that I've rotated to better suit the sweepback of the Tornado's tail and also added the Aussie flag (but not the normal 'RAF' fin flash). 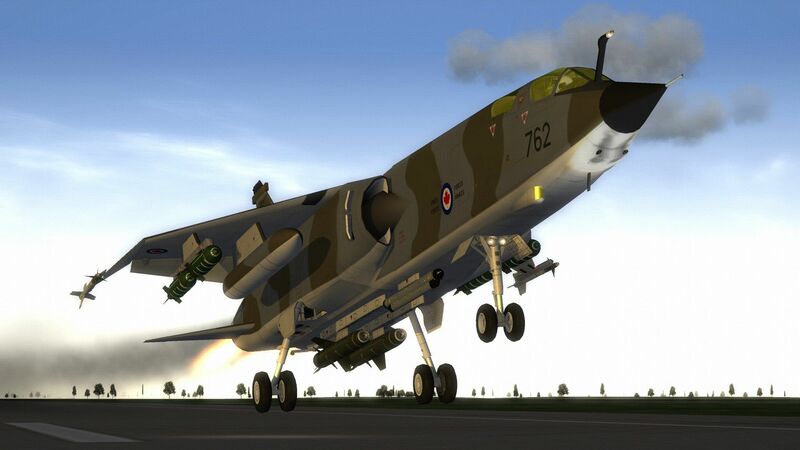 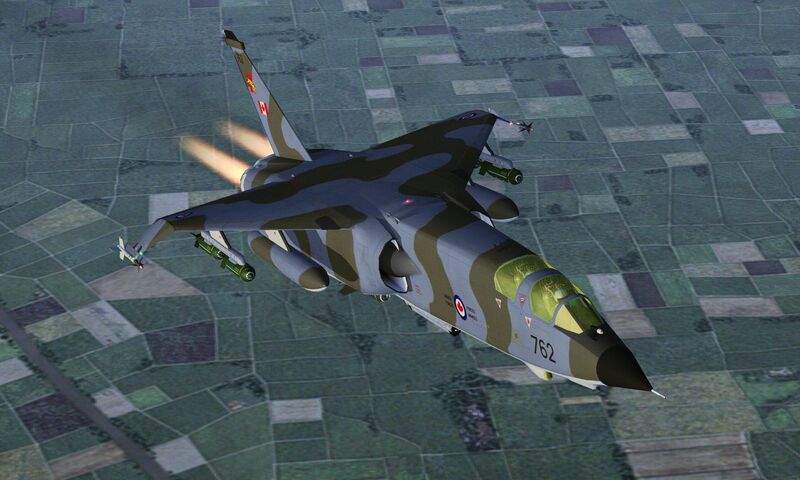 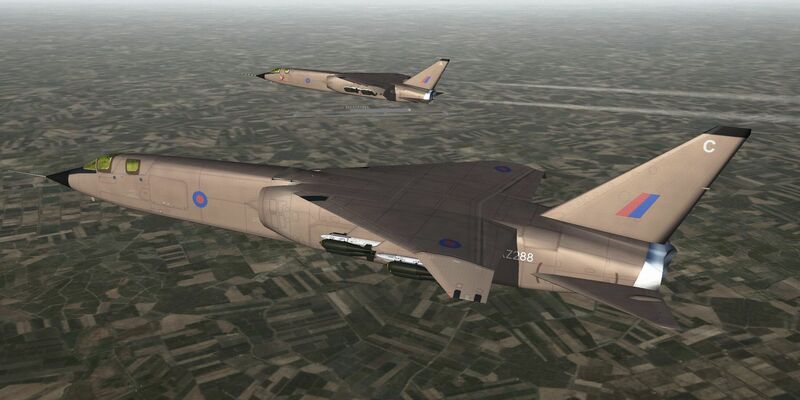 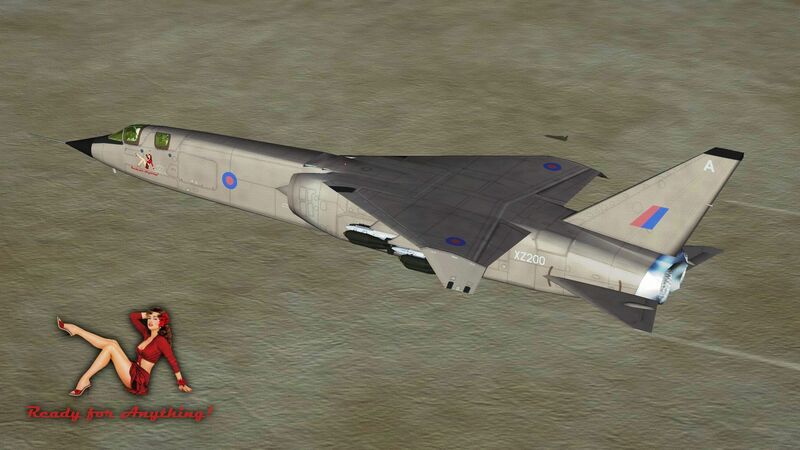 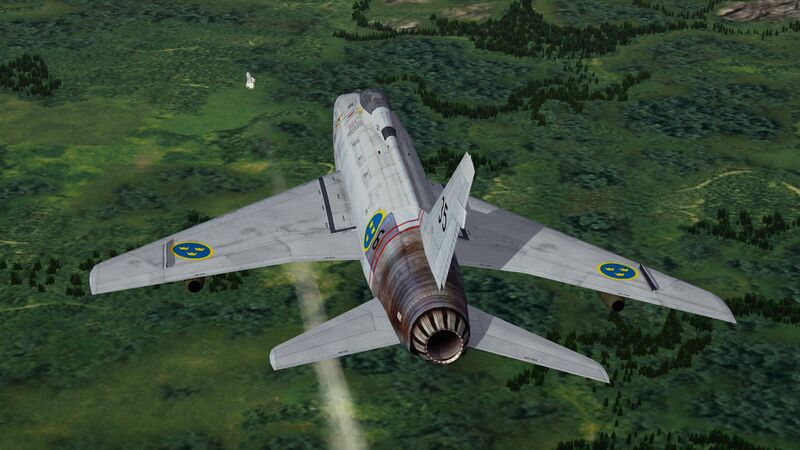 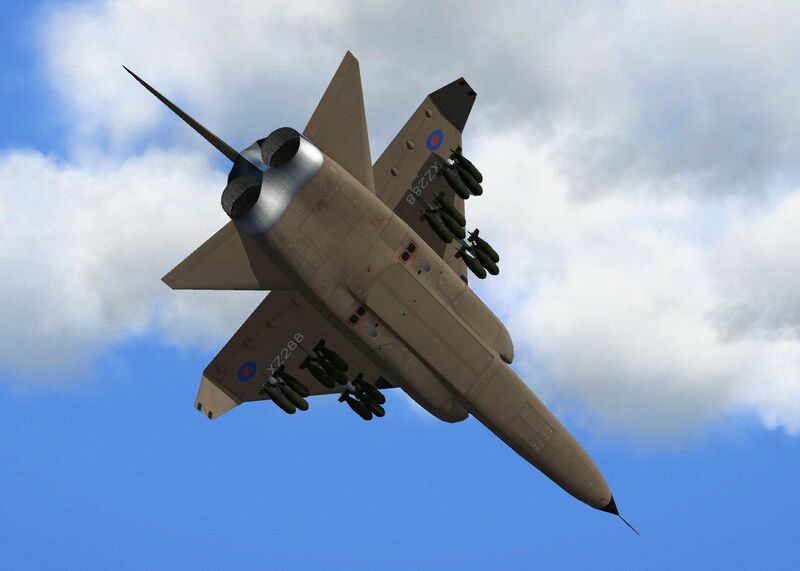 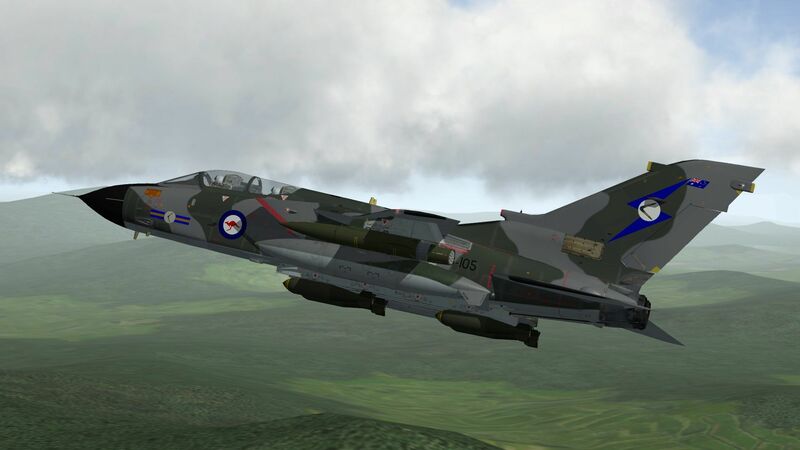 This is Sundowner's ultimate TSR.2, the awesome GR.7 - an advanced TSR.2 with canards! 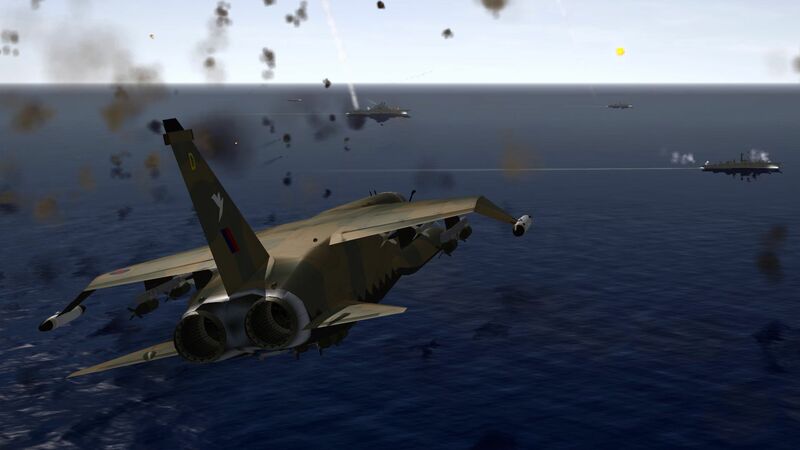 I've included a top shot to show the configuration a bit better and the last shot shows how murderous the anti-aircraft defences are when attacking a Soviet carrier and that's after you've punched through the Yak-38 Forger's. 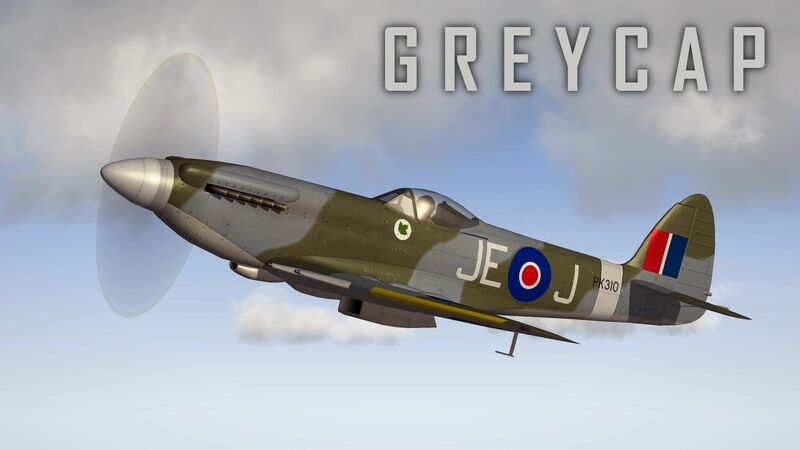 It's also a lovely WW2 style skin! 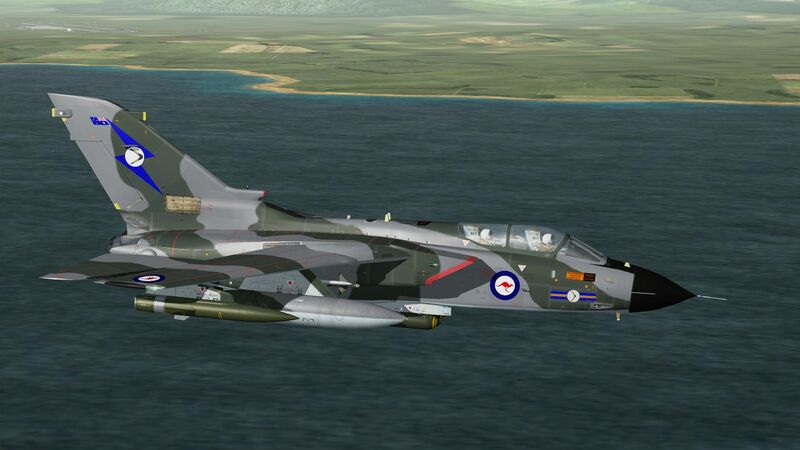 More or less a repeat this one but with refined decal positions and a switch to black fin numbers. 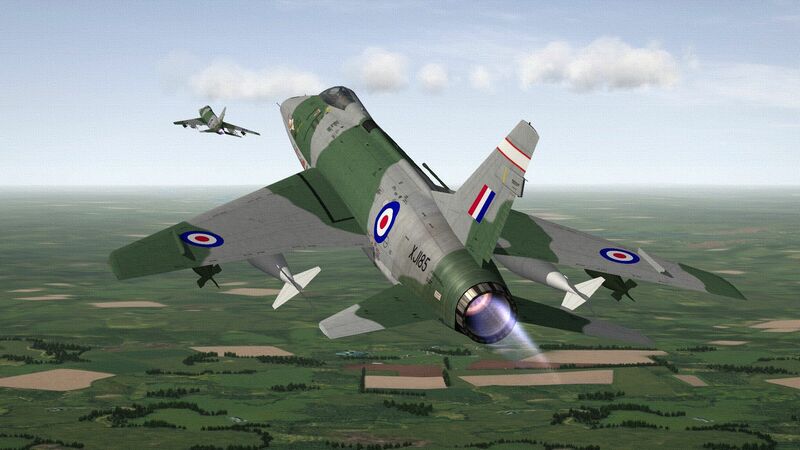 A bit of a repeat this (almost seven years to the day!) 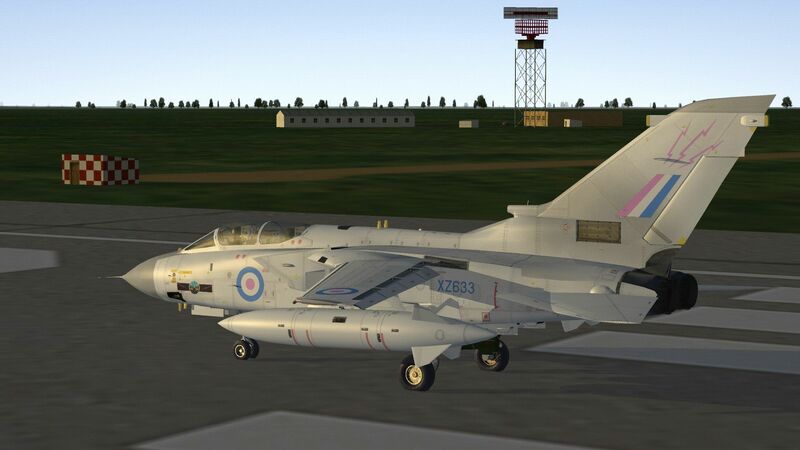 but I've been revising my upload to Combat Ace and thought I'd show some new piccies. 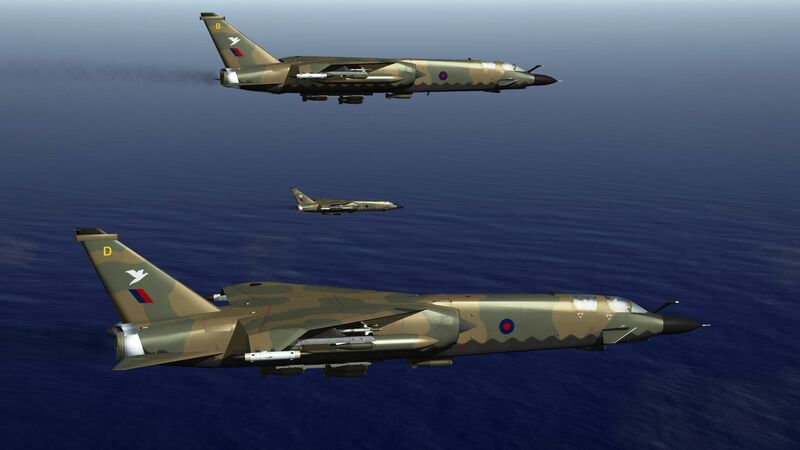 Naughty No.1 Squadron also getting in on the act! 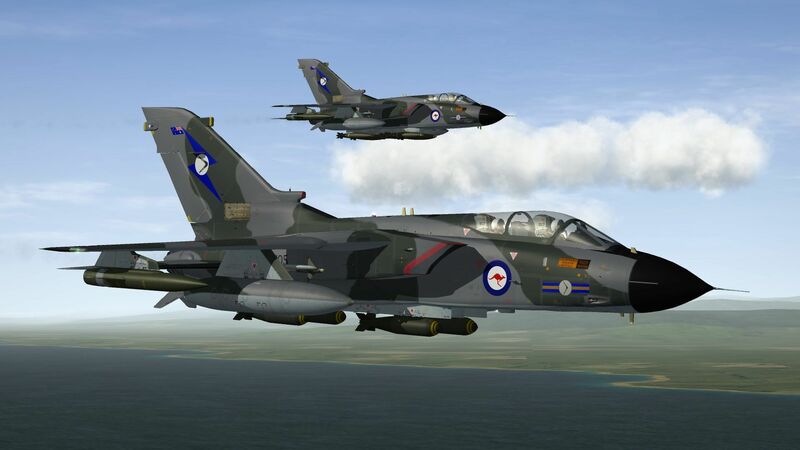 This is another of my revised uploads and to ring the changes I've added No.54 Squadron who were No.1 Squadron's partners in crime for most of the 1960's and I do like doing 'paired' squadrons. 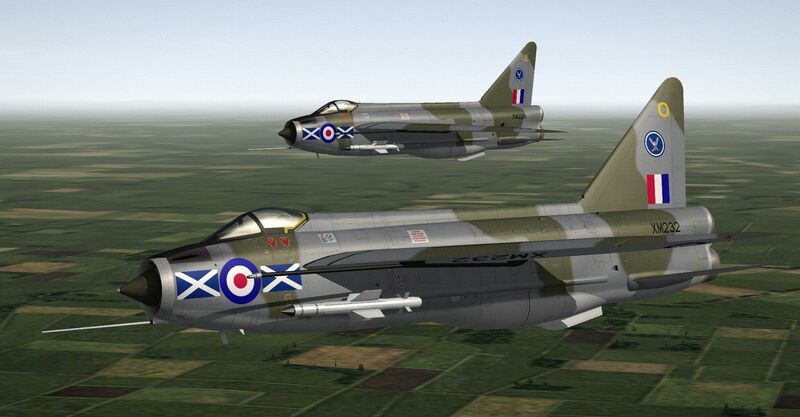 In fact of all the Hunter FGA.9 squadrons only these two were truly home-based with No.8, 43 and No.208 based Near East and No.20 and 28 based Far East. 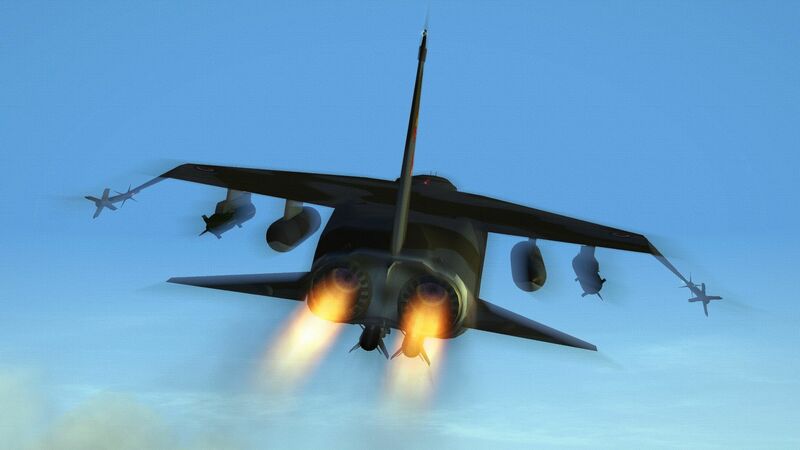 Sorry I'm late. 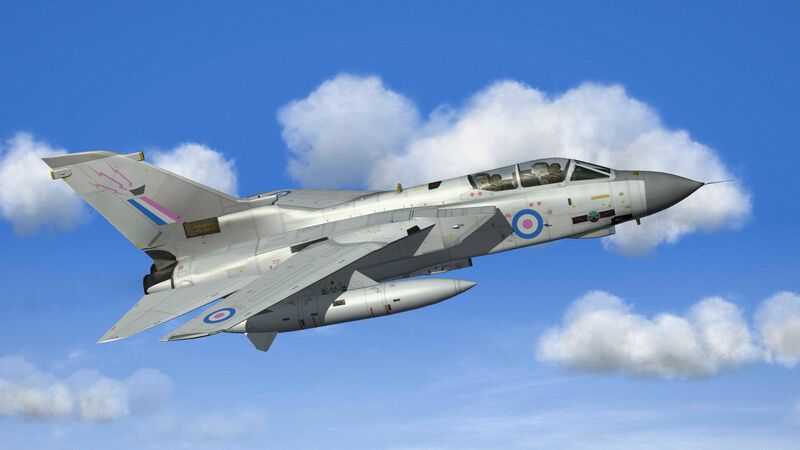 Very busy enjoying the weather today! 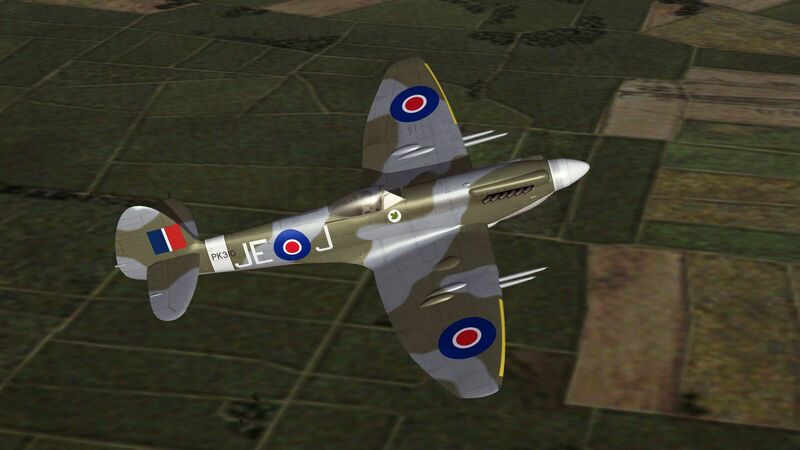 This is sundowner's 'Desert Storm' skin but with new decals by me including nose art on XZ200. 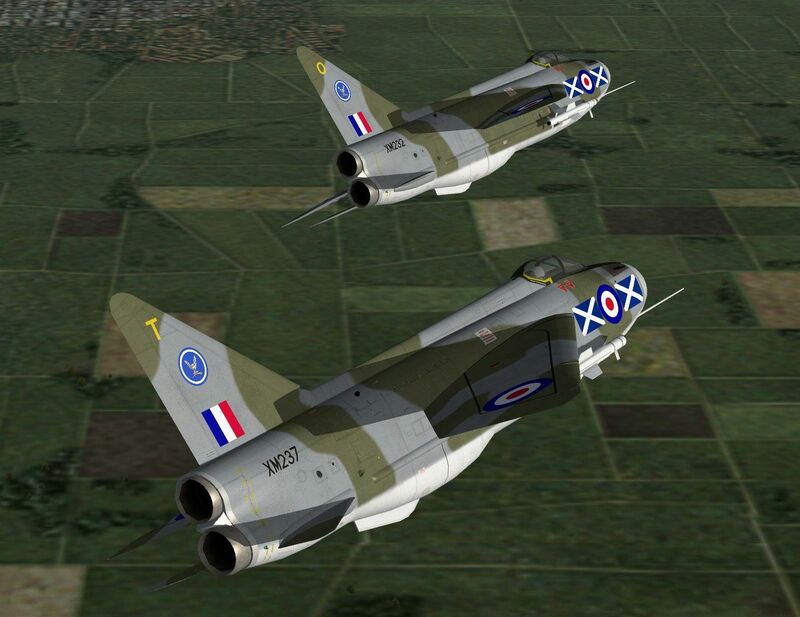 It's surprising how many Gloster Javelin squadrons were disbanded never to reform or re-roled away from fighter/intercept. 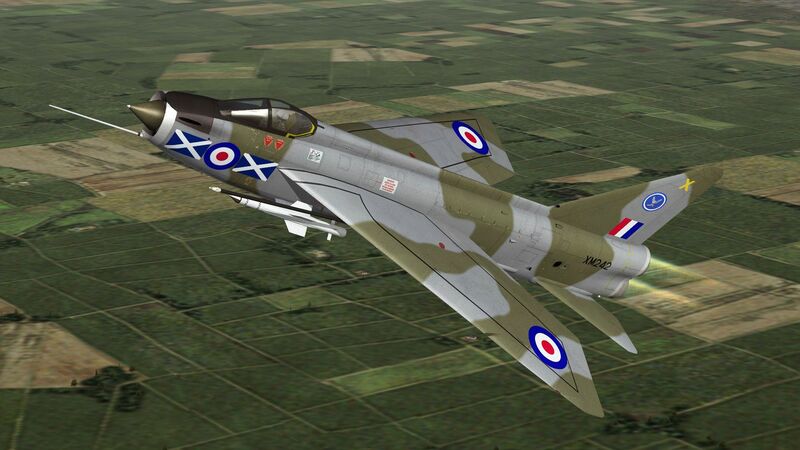 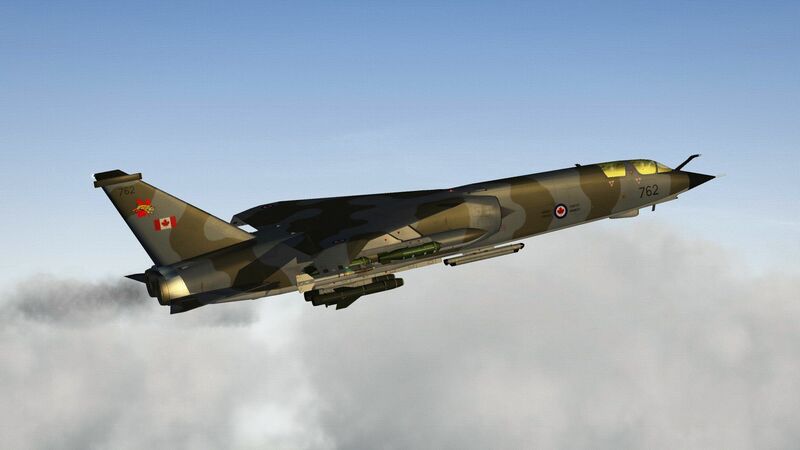 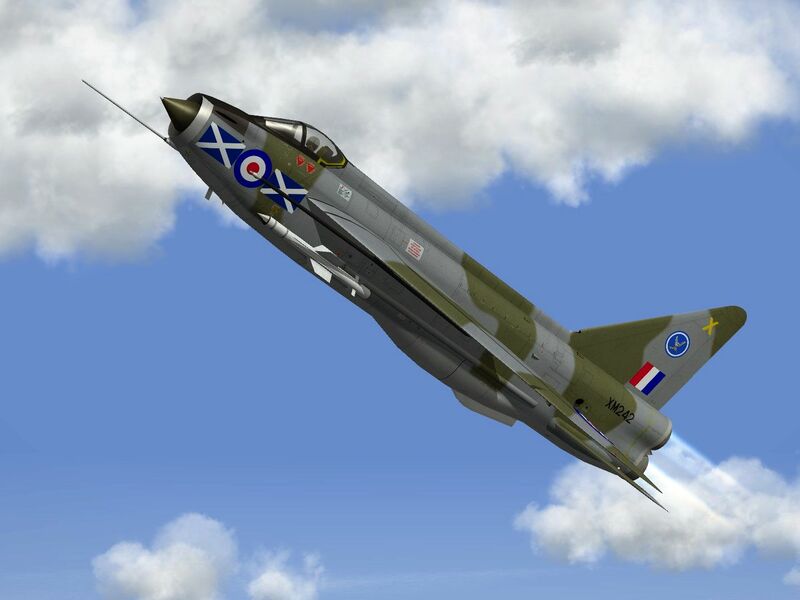 No.151 squadron was one such unit so I've given them the Lightning F.1B - essentially an F.1A with one or two little tweaks to help with nocturnal use... and camo!